People who learned of what I was doing wondered if I got bored, and that is where the power of Wagner's score came in, never letting my mind or ears wander far. The experience was closer to how I imagine singers think of a run, a long-term match comprising several sessions grappling with the role's musical and dramatic demands. One can understand the disappointment of being judged by a critic on the basis of only one night, and the first one at that, where one has the advantage perhaps of the greatest adrenaline but none of the benefits that come from multiple performances under your belt toward the end of the run. All of the singers visibly and audibly relaxed in many ways as the fifth performance drew near, sounding more in their skins, more comfortable in their roles. The orchestra, however, sounded at its best on opening night, in fine form at all performances, just with a few more audible blemishes at the subsequent performances -- worse on closing night, perhaps caused by the unfamiliarity of two of the singers on stage, with some new and unusual tempo choices. A new tenor and soprano, both making their WNO debuts, took over the title roles on this final evening. One had been announced long ago, tenor Clifton Forbis, and he was quite an improvement over Ian Storey in terms of vocal heft. 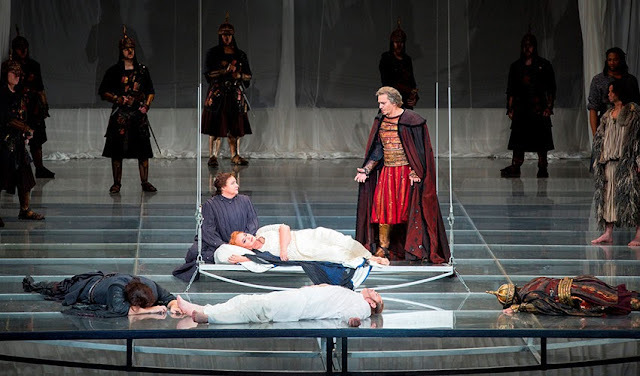 This was a Tristan that sounded like Tristan, heroic and commanding, if lacking some of the subtleties of character that Storey had brought to the role -- the impression much the same as that left by his Siegmund with the National Symphony Orchestra in 2006. One cannot say as much for his Isolde, British soprano Alwyn Mellor, who must be thanked for backing up Iréne Theorin in replacing Deborah Voigt for this production but who paled in comparison to Theorin. Mellor made a satisfying debut as Brünnhilde at the Seattle Opera's Ring cycle last month, although she also had a few cancellations of her own there -- perhaps this was an off night for her. There was less sound at the bottom of her voice, and a flutter in the vibrato that robbed some of the high notes of their power and made others downright wild and out of control, especially in the first act. By Act II, her voice had evened out somewhat, becoming more smooth and honeyed in quality, although Theorin's Liebestod remained the stronger of the two. By far, though, the best part of this final performance was that, finally, the audience allowed the closing chords of the opera to sound and fall into silence before leaping in with applause. Although the realization that I would soon not be going to hear Tristan every three days was sad, that was the best possible way to conclude the run, with the shimmering B major chords that fade into emptiness. WNO Artistic Director Francesca Zambello herself directs the company's next production, Verdi's La forza del destino (October 12 to 26). Her staging sounds dystopian, set in "a futuristic urban landscape, a world of lawlessness and corruption where no one and nothing can be trusted." Speaking of which, we are assured that, in the event of a government shutdown, performances at the Kennedy Center will continue.